At the base of our newest operation – the Long Canyon mine near the cities of West Wendover and Wendover on the Nevada-Utah border – is the Big Spring, an important water source that the two communities once depended on. Recognizing early on that our mining activities might potentially impact this source, we engaged technical experts and both communities to work in partnership on sharing this vital resource. In 2012, Newmont and the two cities formed a Water Working Group, which negotiated a water agreement to address two major goals: safeguard the cities’ existing supply of water during the life of the mine and provide Newmont with an additional source of water for its activities at Long Canyon. As part of the agreement, the cities granted Newmont access to the cities’ surplus water supply, and Newmont agreed to construct two potable water municipal wells. Finished in 2016, the well system provides the cities a more sustainable water source than the spring. In addition, the wells’ capacity is approximately four times greater than that of the old system. 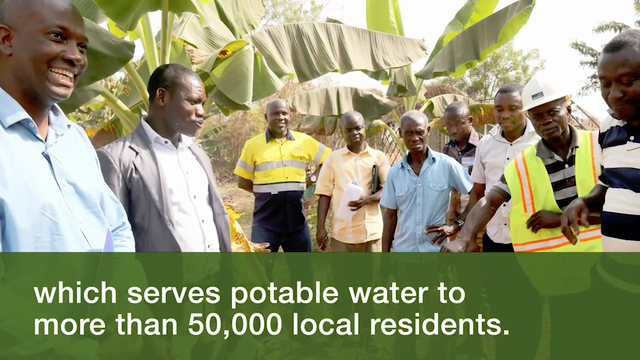 At another one of our operations – the Ahafo mine in Ghana – we have partnered with the communities near the mine for more than a decade to develop and strengthen their potable water infrastructure. Much of this work has been done in Ntotroso and Kenyasi, where community members who were resettled as a result of mining activities reside. Initially, small potable water systems were built and a Water and Sanitation Committee (WATSAN) – composed of trained committee members – was formed to develop the knowledge needed for community members to ultimately independently manage their water system. In 2010, work started on the Kenyasi Water Project (KWP) – an expansion and integration of the water systems. Today, there are three water systems serving more than 50,000 residents, and activity is expected to continue with additional boreholes and the construction of a new overhead reservoir planned for 2017.